Coupralux Giclée Printmaking Studio is hiring an assistant for Production and Customer Support. 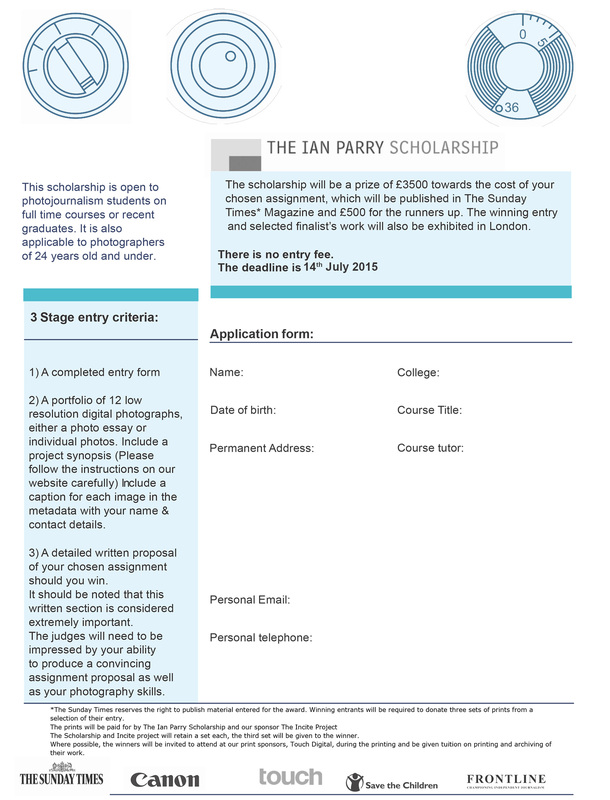 The Ian Parry Scholarship is a free international photographic award for documentary & visual photojournalism students and freelance photographers of the age of 24 years and under. This year we celebrate our 26th year. Click HERE to download the application for and HERE for the digital entry process. The award is open to all full time students including recently graduating students and BA, MA and MFA students. We ask you send us a folder of a 12 image portfolio, an application form and a synopsis of a story you would like to shoot should you win via yousendit or dropbox to entries@ianparry.org You should include research and a budget with your plan. The award will be judged on the 21st July by our Patron Don McCullin and Trustees. Please follow us on twitter @ianparryscholar for updates. We have increased our prize to £3,500 along with a Canon camera for the winner. The finalists will receive £500 each. Save The Children offers an international paid commission to one of the finalists. A selection of the winning images will be published in the SundayTimes magazine Spectrum and exhibited in London, also appearing in a special edition Ian Parry Scholarship catalogue. Women’s Studio Workshop has an artist-centered philosophy and a deep commitment to the individual’s creative process. We support this vision through providing time and space in the form of grants, residencies and internships where artists-in-residence can come to work with 24-hour access to the studios.